July has truly flown by for me. A lot of work, a little getaway, and lots of wonderful hours enjoying the summer sun on the deck. At ScrapMuch? we’re starting August a little early and doing our first Friday reveal today! The good news is, it’s a long weekend here and maybe you’ll feel inspired to get in a little crafty time! I had a lot of fun working with this sketch this week. To me this was a fun mixing of paper from old lines in my stash, as well as some new Pink Paislee and Evalicious embellishments, a little bit of washi tape, some fun stamping, and some fun misting! 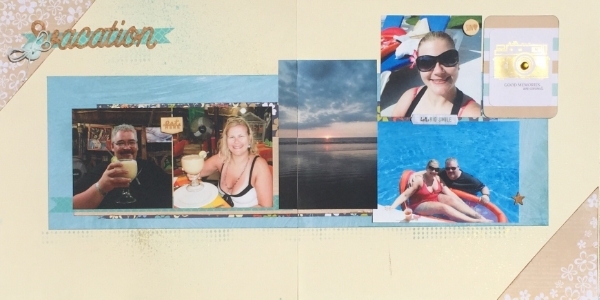 The pictures are all from a super fun trip we took 5 years ago to Puerto Vallarta Mexico. It was a perfect week of sun, sand and smiles. I don’t even care that I’m “behind” in scrapbooking because these are old pictures. It just means I have the opportunity to re-live the memories during the creation process. I’ve also long given up on scrapbooking chronologically and tend to organize my albums by theme. It’s what works for me. So now it’s your turn! Hop on over to the ScrapMuch? blog and see what the rest of the team has created for your inspiration. I hope you join us and share your take on the sketch with us for a chance to win an awesome ScrapMuch? prize! Have a great weekend and I’ll see you again in 2 weeks with my next reveal! I hope everyone is having an amazing Summer! It is by far my favourite season. What can I say? I like it hot! So, I opted to make this week’s ScrapMuch? 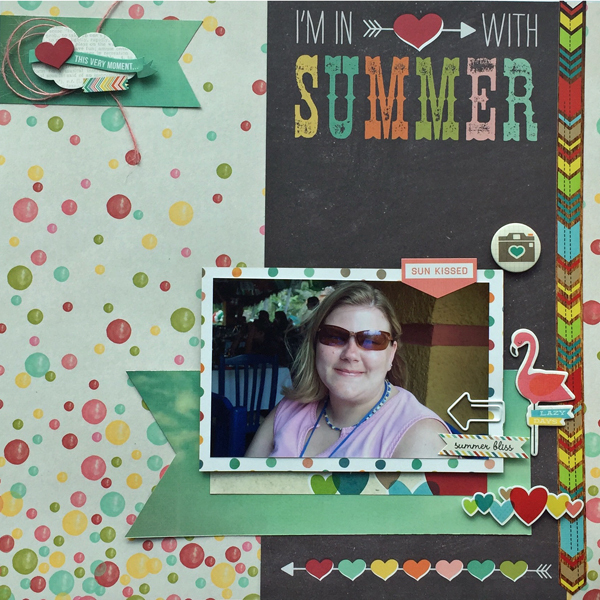 Sketch-y Friday layout about summer! I managed to combine a few years of Simple Stories summer releases for patterned paper and embellishments because they were a similar palette and feel. I used Jillibean Soup for the background page and the whimsical dots worked great with the whimsical hearts and polka dots in the Simple Stories paper. Add in some fun “hairy floss” from American Crafts and a paperclip from Freckled Fawn for some fun embellishing. So now it’s your turn! Hop on over to the ScrapMuch? blog for some Team A inspiration. Create your own layout from this, or any of this month’s sketches, and link up with us for a chance to win an awesome ScrapMuch? prize! As always, I love to see what you create! Have a wonderful weekend! I hope it’s sunny where you are! It’s the first Friday of the month, which can only mean one thing… ScrapMuch? Team A is up with their double page layout reveal! 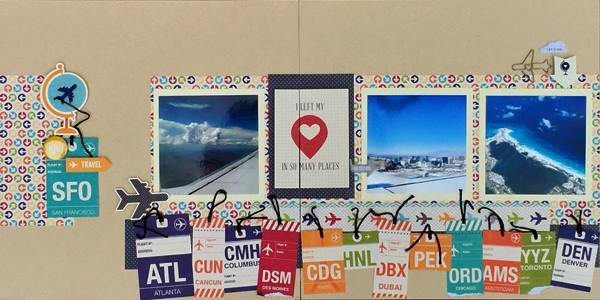 I kept pretty true to the sketch, aside from cutting apart the baggage tag page and using those as a ledge for the photos. So now it’s your turn! Hop on over to the ScrapMuch? blog to see what the rest of the team has been up to this week! I’d love for you to make your own layout to this sketch and share it with us for a chance to win an amazing ScrapMuch? prize! Have a great sunny weekend everyone!